Want to take a ride in Portland? 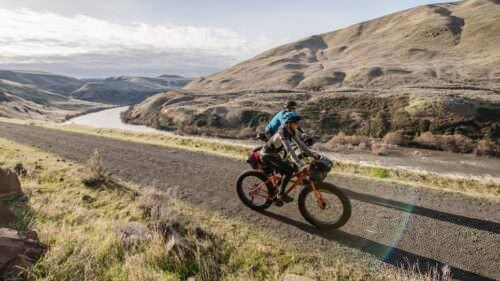 Oregon’s largest metro area is well-known for being one of the most bike-friendly cities in the nation. One reason it holds this designation is the presence of neighborhood greenways — designated bike boulevards that prioritize cyclists, pedestrians and people at play over motorized traffic. The result is a way to see virtually the entire city on the urban equivalent of back roads – think of it as the opposite of a network of freeways crisscrossing a city; instead it’s a comprehensive a network of greenways. You’ll see neighborhood art painted across some intersections, clear directional markings on the street, distinctive street signs along each greenway, and a more relaxed feel for pedaling within the city. 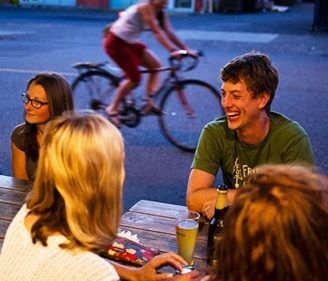 Visitors constantly tell us that Portland lives up to its reputation as a great place to ride; even in a metropolitan area of well more than a million people, you can live very well without ever getting into a motor vehicle. Parks, museums, fine dining and gourmet ice cream – you’ll find it all on or near a greenway. On greenways, bicycles even get the right of way in traffic planning. The low-traffic, low-speed neighborhood greenways include a variety of improvements directed toward cyclists, including directional signs that list nearby destinations, pavement markings called “sharrows” that indicate the presence of bicycle and foot traffic, stop signs that favor greenway traffic, speed bumps and, on busy arterials, extended medians with bike islands that help riders cross safely. 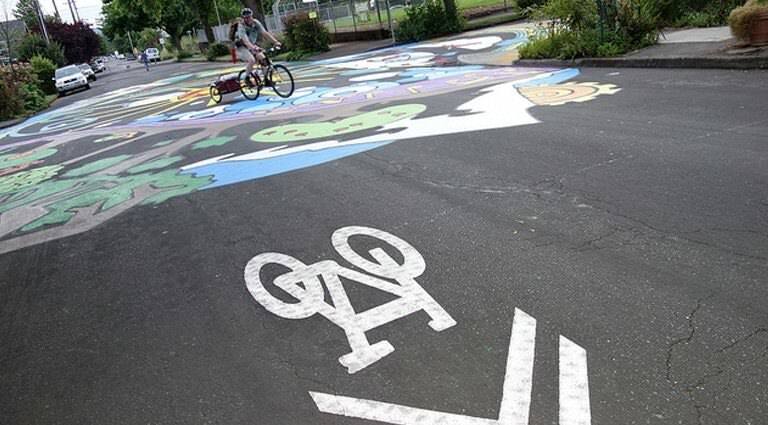 Neighborhood greenways are part of Portland’s Bicycle Plan for 2030 — a long-term program that will encourage bike riding in hopes of decreasing automobile traffic, creating safer neighborhood streets, keeping city-dwellers healthier and contributing to a cleaner environment. Portland’s network of neighborhood greenways began in the city’s core and is slowly expanding outward, with greenway routes covering much of close-in Portland, north, east, northwest, northeast and southeast of downtown. You can support and enjoy Portland’s neighborhood greenways project by riding a greenway and by checking out the most recent greenway developments on PBOT’s current project map. This map shows both existing routes and planned greenways throughout Portland. 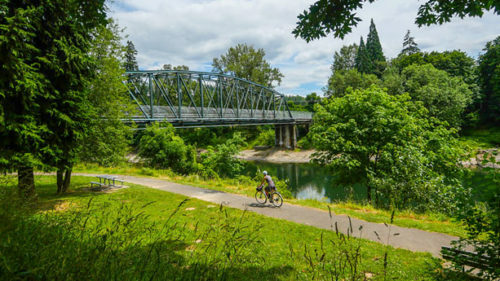 Take a look, and find a greenway route to your favorite Portland destination.